PM Narendra Modi and Japanese PM Shinzo Abe jointly laid the foundation stone for the high-speed bullet train project between Ahmedabad and Mumbai on 14th September 2017. The train will cover a distance of over 500 km in around two hours. The project is expected to be completed by 2022. Japan has extended a soft loan for the ambitious project conceptualised by Mr Modi. 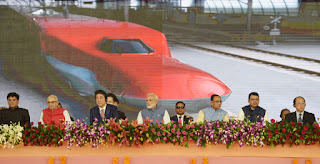 The two leaders also laid foundation stone for the dedicated High Speed Rail Training Institute for the Ahmedabad-Mumbai bullet train to be established inside the existing campus for the National Academy of Indian Railways at Vadodara. The two leaders will also hold the 12th Indo-Japan annual Summit meeting at Gandhinagar today after which agreements will be signed. Gujarat chief secretary JN Singh said 15 agreements will be signed for investments in the state during the visit of the Japanese Prime Minister. Earlier on Wednesday, Mr Modi held an 8-km road show with his Mr Abe and his wife in Ahmedabad. The road show, which began from Ahmedabad airport ended at the Sabarmati Ashram. The road show, designed to showcase India's cultural diversity, saw artistes from several states performing on 28 stages erected by the roadside.